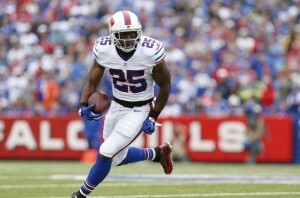 LeSean McCoy will miss Sunday's game versus the Tennessee Titans. versus the Tennessee Titans. The Bills will turn to Boobie Dixon, Cierre Wood and Daniel Herron in their backfield Sunday against the Titans. The Titans have the 20th ranked rush defense so far this season, so there are fantasy points to be had for a running back facing them. The Titans are giving up 113 yards per game rushing with 3 rushing touchdowns. So, based on their averages that is about 17 fantasy points that one of the Buffalo Bills running backs could have. The Buffalo Bills have run the ball 121 times this season, which ranks them at number 8 in the NFL. They have the 6th best running game in the NFL, averaging 128 rushing yards per game. 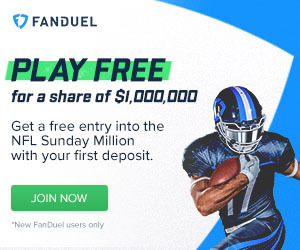 Another thing that could have the Bills run even more than normal is the availability of their leading wide receiver Sammy Watkins. Watkins is nursing a sore calf and reportedly will try the calf out before the game before the team doctors will make the final call on whether or not Watkins will play during pregame warm ups. Boobie Dixon looks to fill LeSean McCoy's big shoes this Sunday versus the Tennessee Titans. Dixon is listed as 6.1 233 pounds and was clocked in the 40 at 4.59 when coming out of college. Dixon does not have the speed to get a lot of yards rushing, but he is intriguing because I think he would be the guy that I would give the ball to at the goal line. With the Titans giving up about a touchdown a week, there is a good chance that one of the Bills running backs will score a touchdown. Boobie Dixon is slated to get the start, but is still dealing with the aftereffects of a calf injury. In Rex Ryan's ground-and-pound offense the Bills would need a back to share the load, even if Dixon were completely healthy. The most likely candidate to share the load with Boobie Dixon is Daniel Herron, a player the Bills just signed this week. 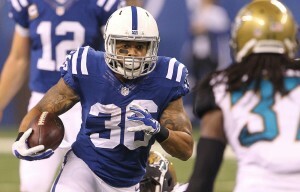 Herron is in his 3rd season in the NFL and has spent time with the Cincinnati Bengals and the Indianapolis Colts. Daniel Herron is the new guy in Buffalo and hopes to be ready to get some carries versus the Tennessee Titans. somewhat undersized and does not have prototype speed. During Herron's short 3 year career he has tallied only 87 rushes with a 4.5 yards per carry average, which is pretty good. I could see Herron getting the carries outside of the red zone and away from the goal line. 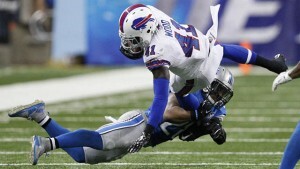 But, when the Bills get closer to the end zone I can see them inserting Dixon to pound the ball in the end zone. Herron could possibly give you 5 to 7 points in Sunday's game. 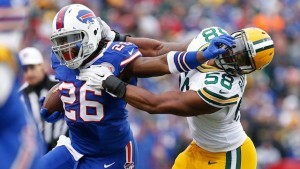 Cierre Wood hopes to help fill the big shoes left by LeSean McCoy. 5.11 226 pounds and has been clocked at 4.52 in the 40 yard dash. Wood has prototype size and speed that you want for a running back in the NFL. I am not Wood's running back coach that works with him everyday, but he is the one that I would really try to get some touches.